Dark Chocolate Peanut Butter Oatmeal is the best way to start the day! Made with unsweetened almond milk and maple syrup, it’s actually a healthy, refined sugar free breakfast recipe! This post contains affiliate links. See our Disclosure Statement for more information. Over most of the fall season, I couldn’t get enough comfort food. I ate way too much pumpkin spice everything, and was head-over-heels for every casserole, all the mac and cheese, and every potato dish that I laid my eyes on. Nothing was safe…especially my waistline. It got a bit ridiculous. At this point, you’re probably wondering why in the world am I sharing a recipe for Dark Chocolate Peanut Butter Oatmeal? I should totally be making salad recipes. Probably. But, I’m not quite there yet. I’m weaning myself off of comfort food, with more comfort food. Because, you guys, this Dark Chocolate Peanut Butter Oatmeal has whole grain oats, chia seeds, and unsweetened almond milk. What it doesn’t have is refined sugar. Minus the chocolate chips on top, but those are totally optional if your level of self-control is a notch or two above mine. 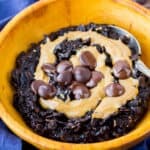 The dark chocolate in this recipe for Dark Chocolate Peanut Butter Oatmeal comes from dark cocoa powder and there definitely isn’t any sugar in that! Have you ever tried it plain? Yuck, just yuck! I had to add a little something, something to give it the best flavor. So, this Dark Chocolate Peanut Butter Oatmeal is sweetened with real maple syrup. You could probably swap that out for honey or agave, if you prefer. If you’re more into no-sugar sweeteners, you could give those a try but I haven’t yet tried that myself. This recipe is even harder to resist when you realize that it takes less than 10 minutes to whip up a bowl of Dark Chocolate Peanut Butter Oatmeal for yourself. Obviously, it’s a great way to start the day, but I also like it for when the chocolate cravings really kick in or for a late night snack as well. There really isn’t any prep work to be done for this recipe. Doesn’t that make it even that much more tempting?! Just get your ingredients out and let’s get started! Combine the rolled oats, dark cocoa powder, chia seeds, unsweetened almond milk, and maple syrup in a microwave-safe bowl. Stir until well blended. Microwave on high for 2 minutes. If all of the liquid isn’t quite absorbed, microwave in 30 second increments until the oatmeal reaches the desired thickness. See the notes in the recipe card below for stove top instructions. You can top this glorious bowl of Dark Chocolate Peanut Butter Oatmeal with dark chocolate chips if you’d like! Adding dark chocolate chips to this recipe will increase the sugar content. Using dairy milk instead of unsweetened almond milk will add some sugar to the recipe. You may need to cut back on the amount of maple syrup used to reach your desired level of sweetness. Store extra Dark Chocolate Peanut Butter Oatmeal in the refrigerator and use within 3 days. 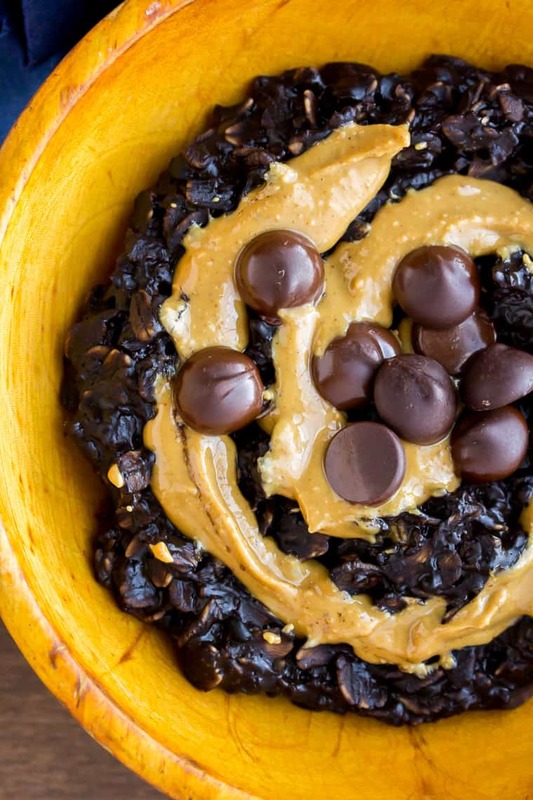 Love this Dark Chocolate Peanut Butter Oatmeal recipe? Follow us on Pinterest, Instagram, and Facebook for more! 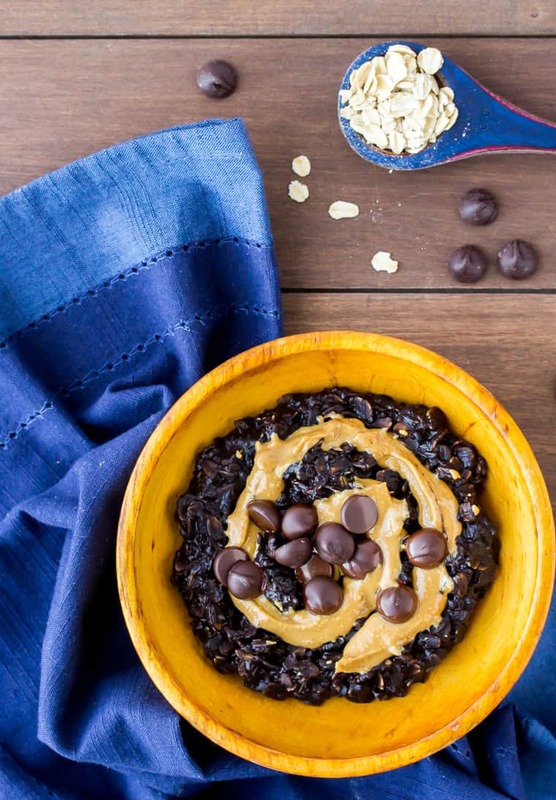 Dark Chocolate Peanut Butter Oatmeal is the best way to start the day! Made with unsweetened almond milk and maple syrup, it's actually a healthy, refined sugar free breakfast recipe! Top with dark chocolate chips, if desired. To make this oatmeal on the stove top, add all of the ingredients to a small saucepan over medium heat. Cook until the oatmeal reached the desired thickness, about 5 minutes. Pour the oatmeal into a bowl and stir in the peanut butter. Top with chocolate chips, if desired. Adding chocolate chips to this recipe will increase the sugar content. Store extra oatmeal in the refrigerator and use within 3 days. your photography is outstanding! Its literally making me want to make oatmeal right now! 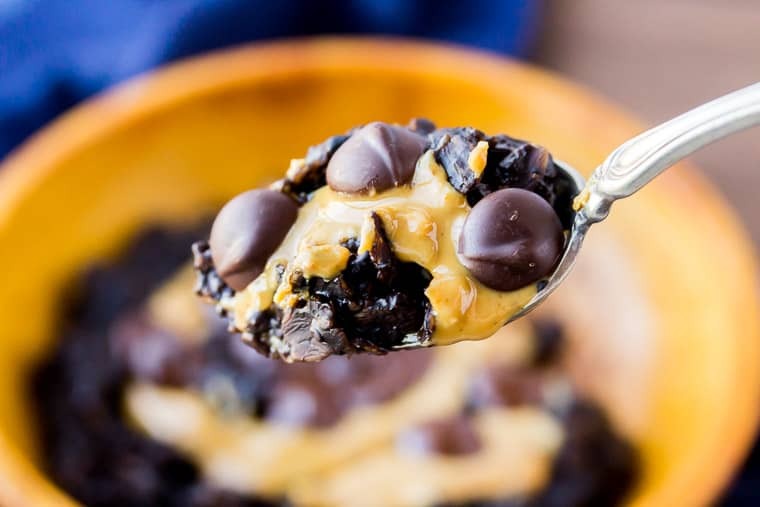 The chocolate and the peanut butter …. yummy! Love how this breakfast is healthy yet indulgent. Great recipe, will try soon. Thanks for sharing. Comfort food with comfort food – I LOVE it. And I love that this is naturally sweetened. Plus I love chia seeds in my oatmeal. This would be a great treat for my daughter! Haha…it was a great plan! My kids love it – I hope your daughter does too! Haha…I’m already back to salads – getting a jump start to the new year, but I definitely indulged plenty up til now 😉 Thanks for stopping by!! Sounds like such a great breakfast, love the color from the dark chocolate! Love the idea of putting cocoa powder in my oats! This is exactly my kind of healthy-indulgent breakfast.